We all love a holiday and an escape from the daily grind, but what about if you had your very own holiday home and could escape whenever your heart desires? 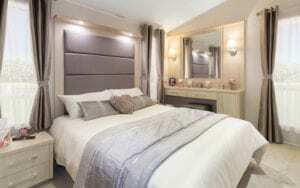 Take a look inside our stunning Aspen caravan and you won’t be disappointed. 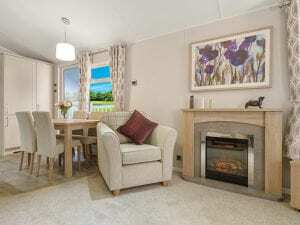 This caravan offers all the comforts of home and so much more. 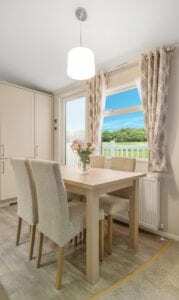 All Cofton holiday homes are modern and clean, with comfortably furnished living spaces and fully equipped kitchens. Energy efficient white PVCu double glazed windows and doors. 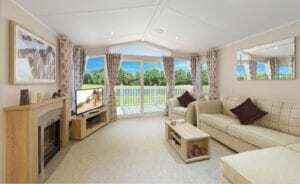 Rooms include, lounge, kitchen, dining area, En-suite, Master Bedroom, Twin Bedroom and Family Shower Room. Double cavity gas over / grill with glass splash-back and extractor fan. The floor to ceiling cathedral-style windows are simply breathtaking, allowing acres of light to cascade in. Freestanding L-shaped sofa with fold-out occasional sofa bed, two armchairs (one swivel) and scatter cushions. Freestanding dining table and fully upholstered chairs. One piece fibreglass shower enclosure with thermostatically controlled shower. We’ve brought the traditional Shaker kitchen bang up to date giving you a design that combines classic with contemporary. The swivel chair is ideal for people that love to see the inside and outside of their surroundings. The dressing table has drawers and a cupboard to take care of all your beauty and styling essentials. 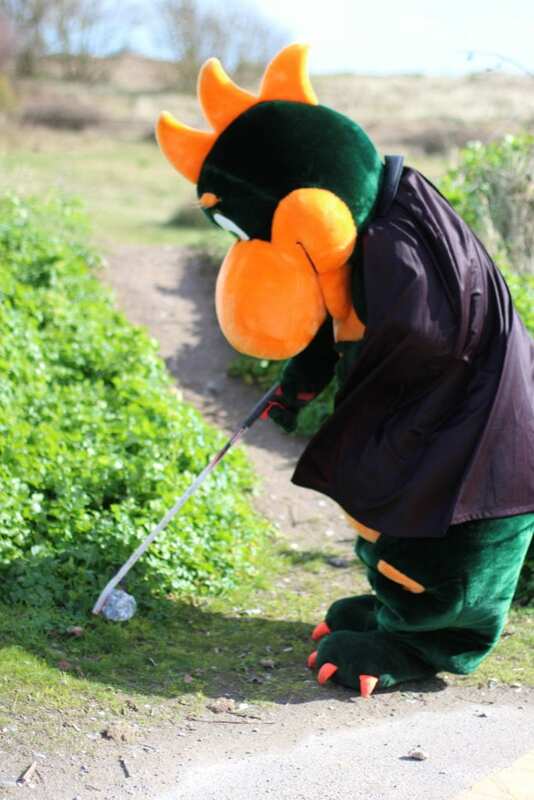 What you will find at Cofton? 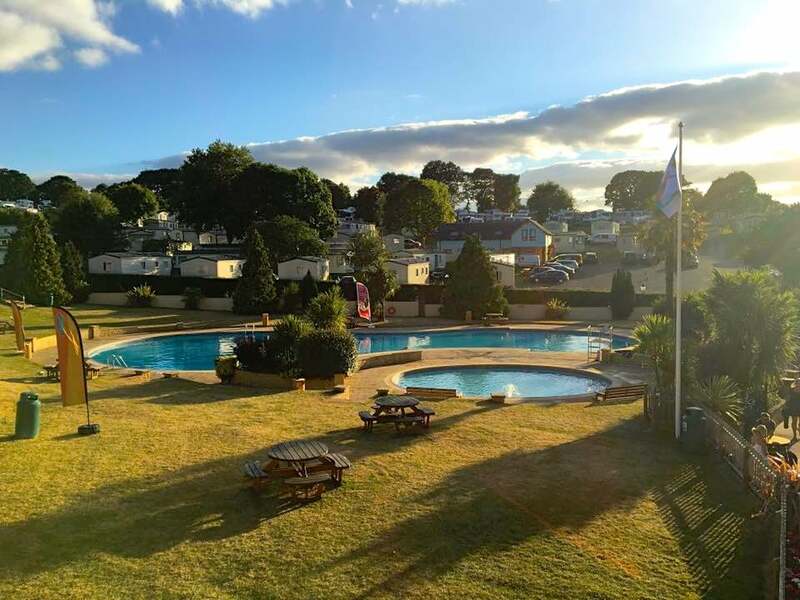 Hidden in the depths of the picturesque South Devon Coast, you will find award winning, independent, family run holiday park Cofton holidays. With everything you need here on site including 4 fantastic eateries, an onsite leisure complex and 80 acres of beautiful landscape, you need never leave. 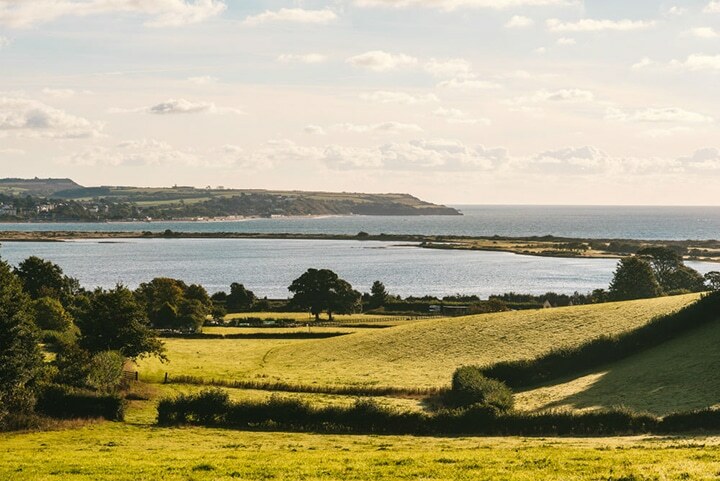 If you’d rather venture a little further afield, then you’re in for a treat because Cofton is the ideal central point for your Devon adventures. 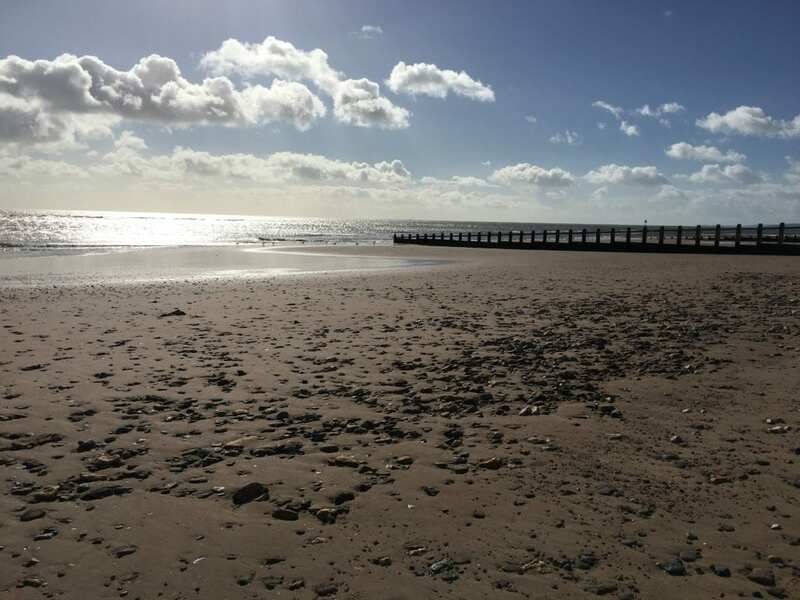 Surrounded by beautiful countryside, stunning coastlines and amazing attractions, there is no end to the adventures you can have from your holiday. Another exciting award for the cabinet here at Cofton, we are delighted to been awarded with a AA 5 Pennant Gold rating for the second year running. 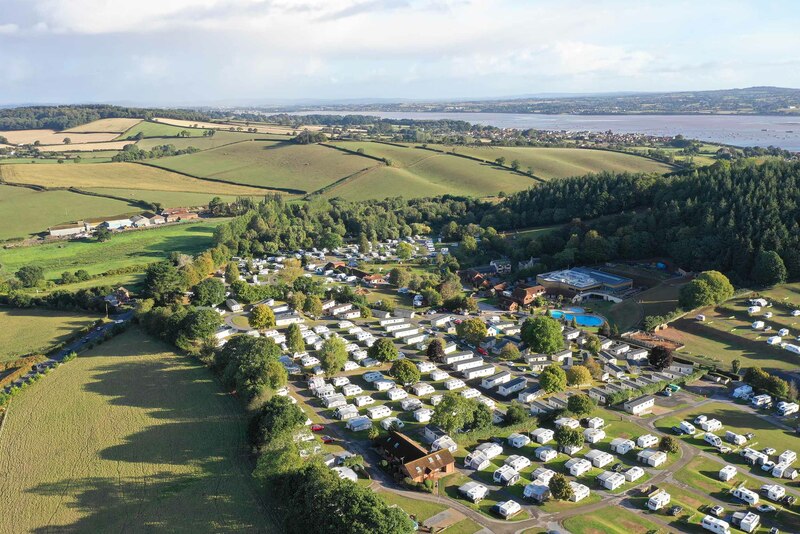 The AA visit over 900 campsites, looking at touring pitches, facilities and hospitality before grading campsites from between one to five pennants, with Gold Pennants only awarded to the very best campsites. Cofton was given a 92% approval rating being commended particularly for its well-stocked coarse fishing lakes, the attractive outdoor pool and excellent indoor pool, bar and restaurant with outside seating and terrace, daily entertainment programme and the spotless facilities and well-maintained pitches. 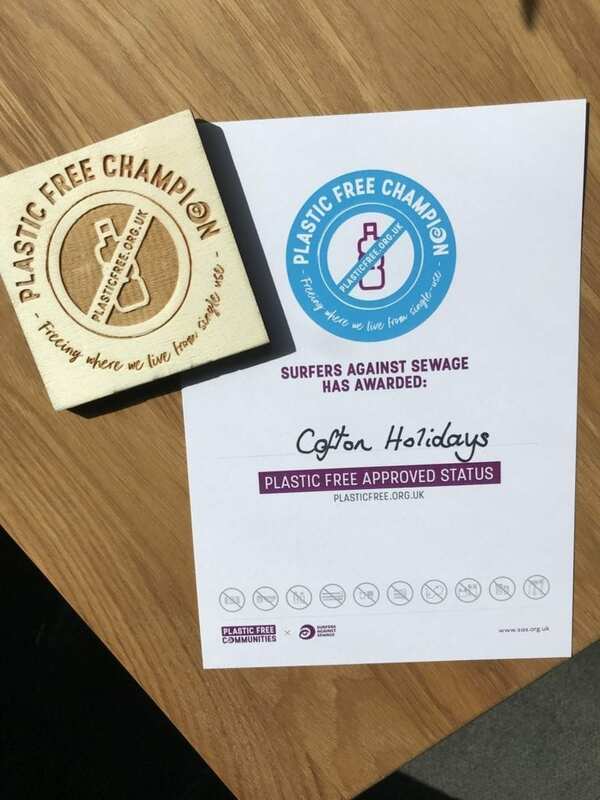 In our quest to become the most environmentally friendly holiday park, we are delighted to have been officially named a ‘Plastic Free Champion’ by the prestigious Surfers Against Sewage. 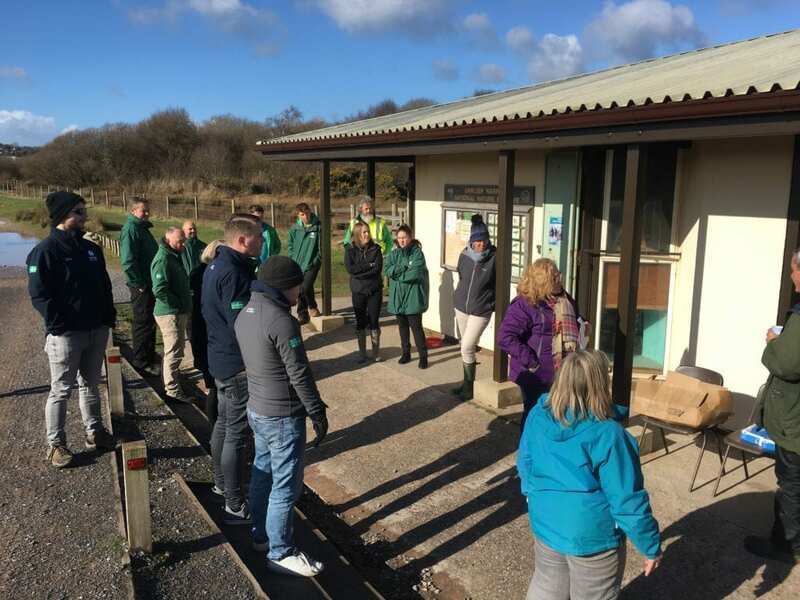 There were 17 businesses in the Teignbridge area selected to be audited as part of the process and only 9 being awarded. 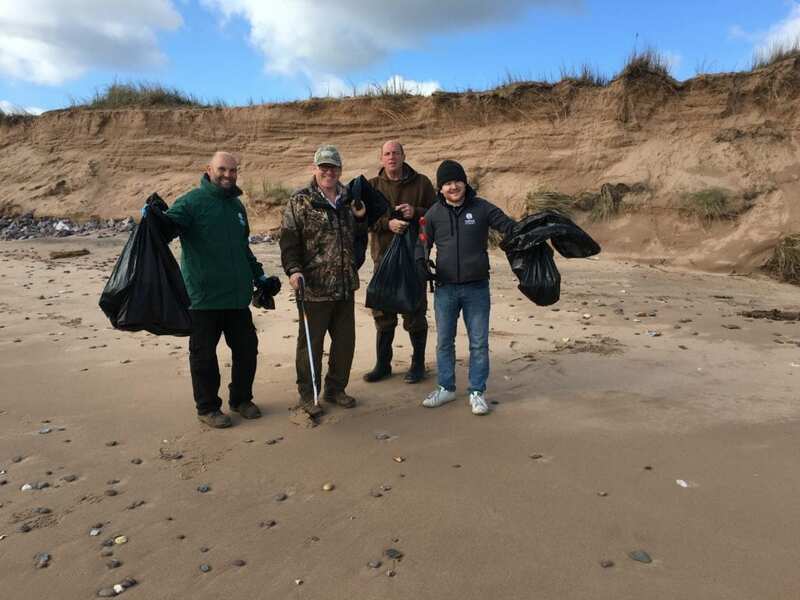 So we were delighted to have been chosen for our commitment to the environment. 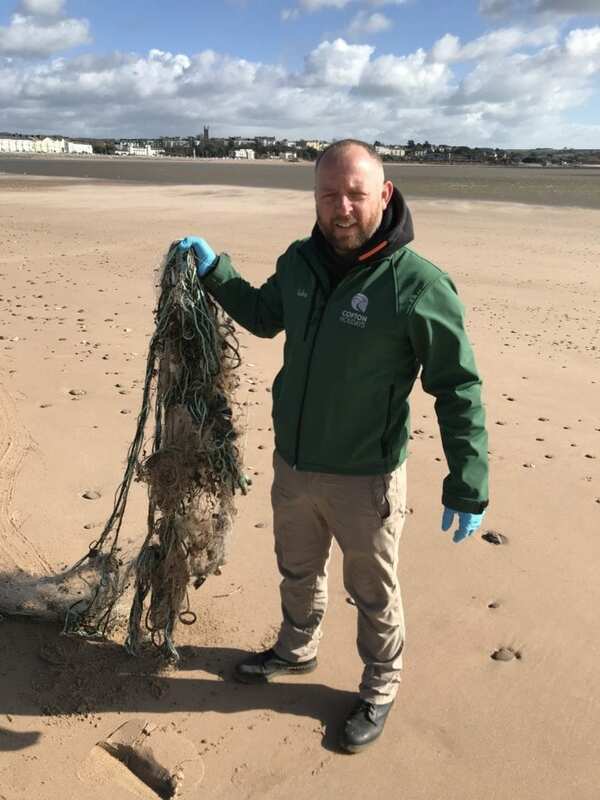 In the past few months the team have worked hard to make sure plastic is used responsibly and where possible we make substitutes to reduce consumption. 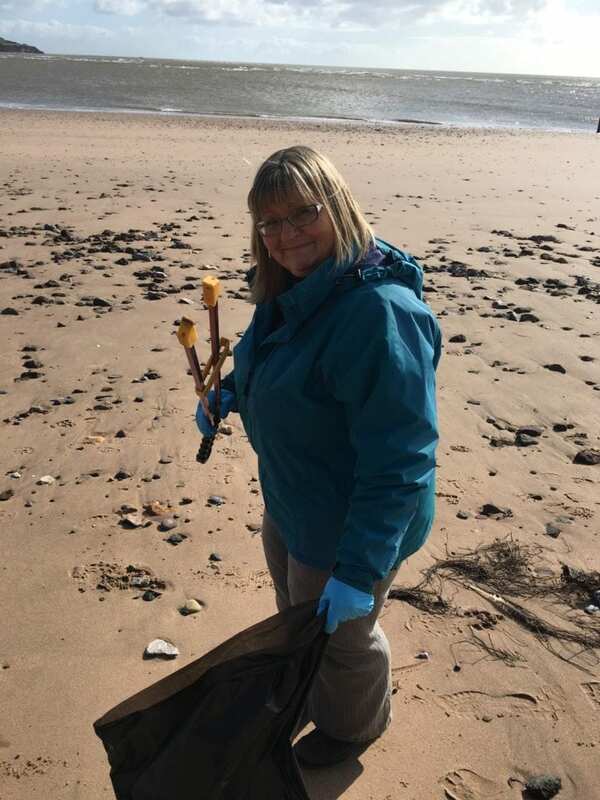 Alongside this the team have taken part in litter picking exercises in the community, both at local blue flag beach Dawlish Warren and around the Cockwood and Starcross area. 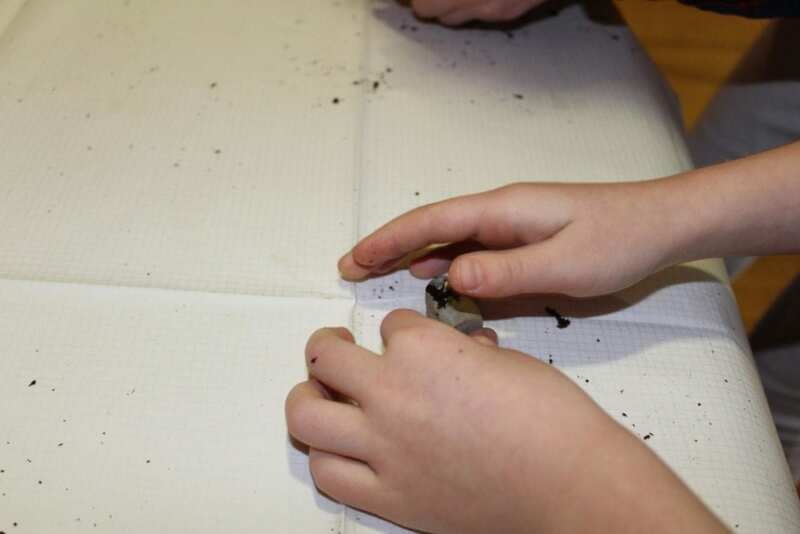 In the coming months, there are more exciting projects that we will be getting involved with in the local area. Keep your eyes pealed for updates. 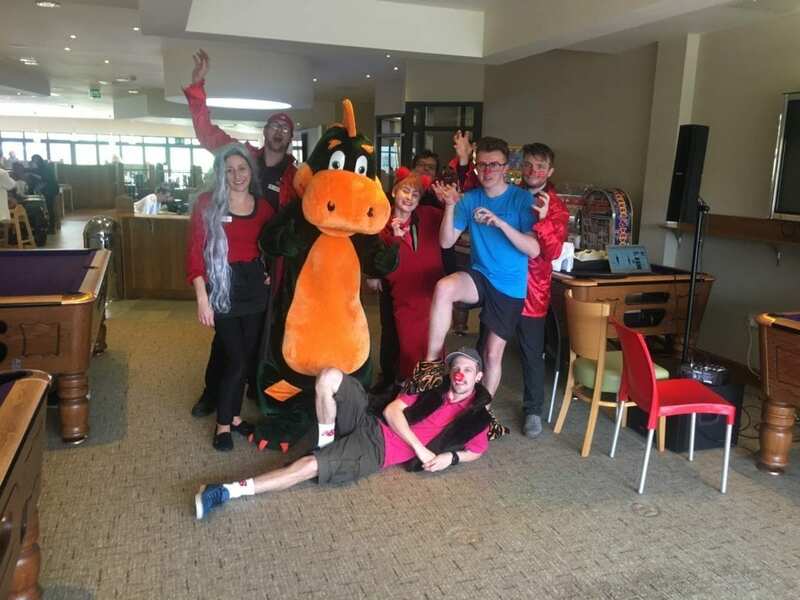 The Easter holidays are finally here, and The Cofton entertainment’s agenda is in full swing, with shows now every night of the week until October. 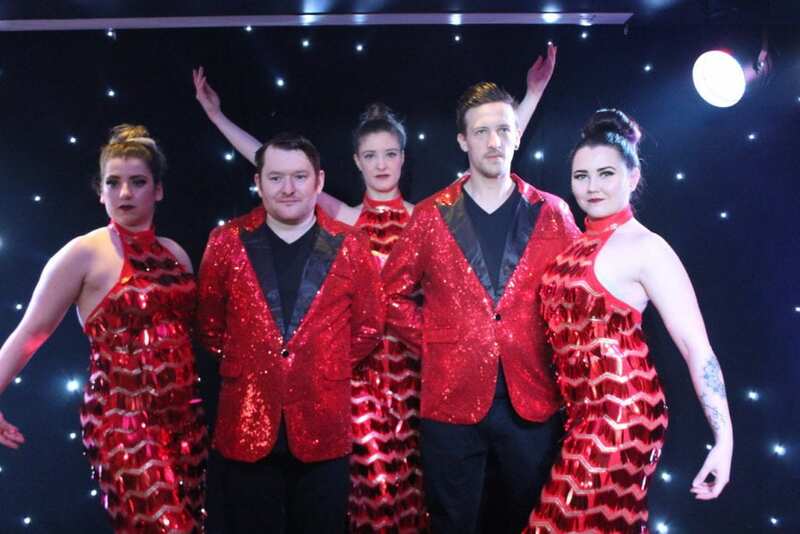 Last night, the Cofton entertainments team took to the stage in dazzling costumes for the first of many shows, paying tribute to some of the best loved movie soundtracks in a performance of ‘Curtains up’. This weekend at Cofton, Elvis tribute Barry Paull and our entertainments team took to the stage in the Warren for some showstopping entertainment. 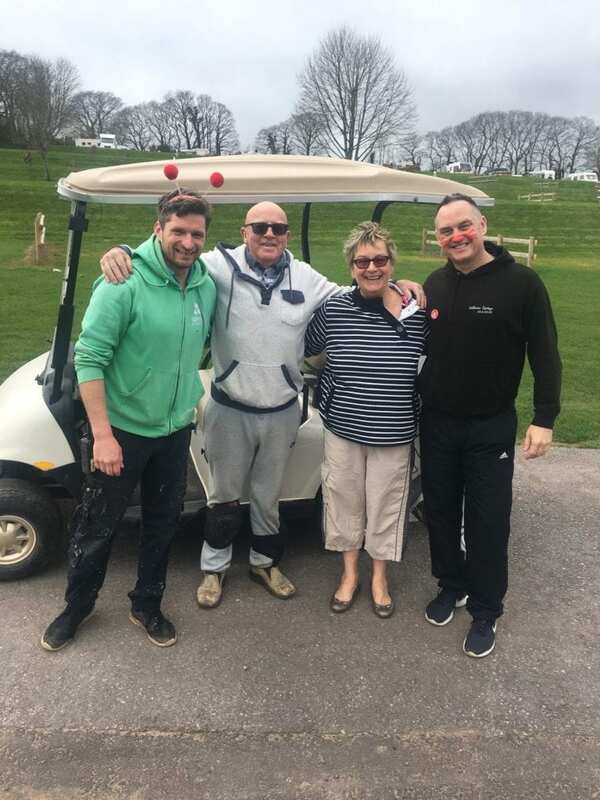 At the same time, we could not be more delighted than to see the amazing Jimmy Tamley from Devon take to the stage on Saturday nights Britain’s Got Talent. 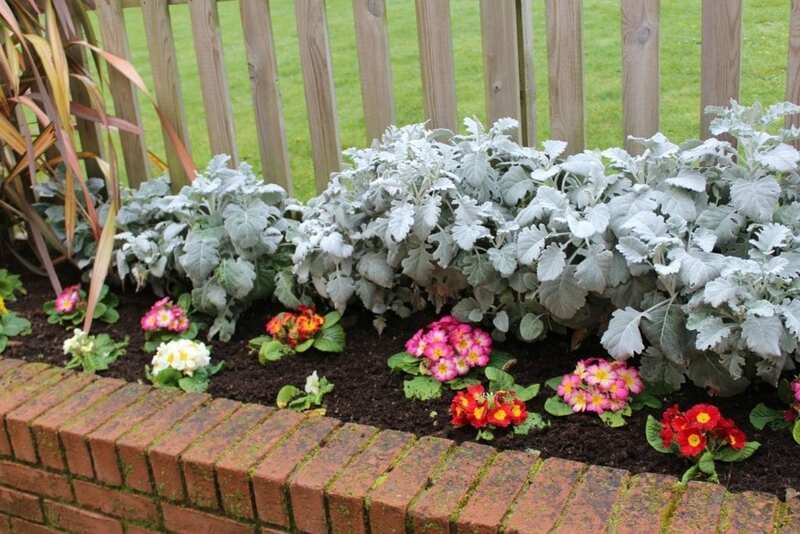 At Cofton we take great pride in keeping our gardens looking plush and flower beds blossoming. Aside from gardens of beauty, as a team we take great pride in looking after the environment and creating habitats where wildlife can thrive. 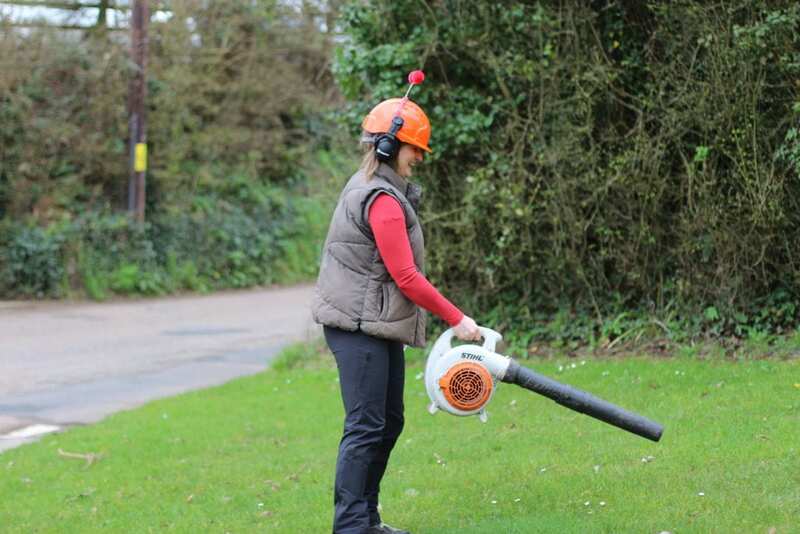 This includes butterfly gardens and flower beds situated all around the holiday park. 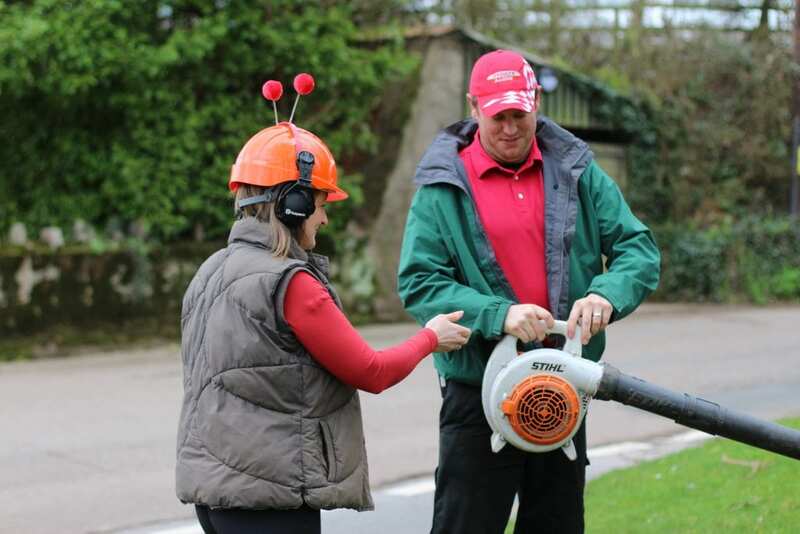 As part of this years entertainment schedule, the team have worked hard to make sure that as well as fun for the family, there are interesting educational elements that help your children to learn the importance of looking after the environment. Jay Wallace-Langan Head of Entertainment at Cofton commented on this years unique entertainments agenda saying, “We wanted to provide entertainment which was outside of what you would normally expect at a holiday park. 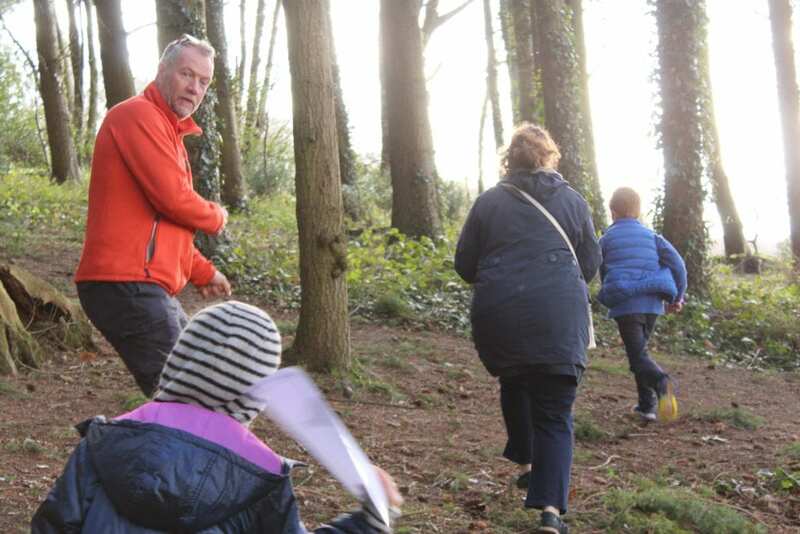 We have a whole host of indoor and outdoor activities, but new for 2019 are lots more activities all about appreciating the great outdoors and the natural environment”. Recycling has always been a huge priority for Cofton, with a commitment to responsible waste management throughout the site. 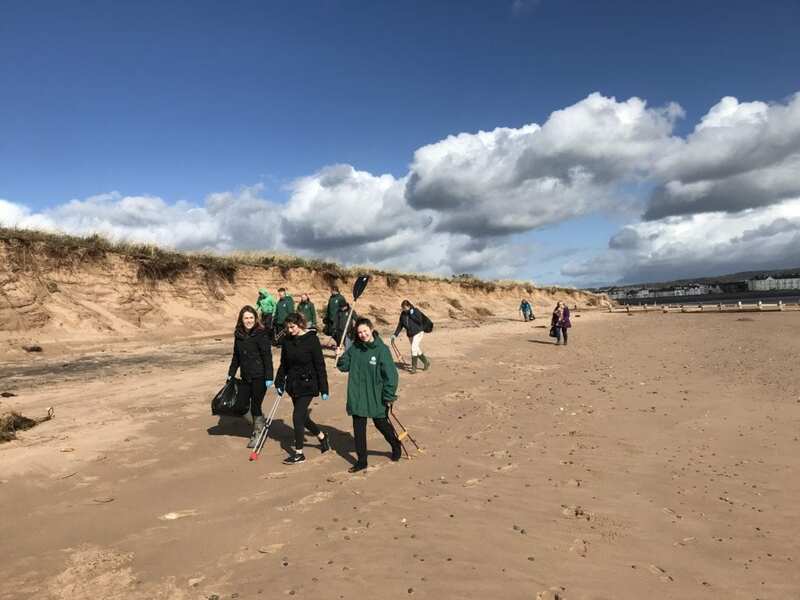 We work in partnership with Devon Contract Waste who operate on the basis of Zero to landfill and also have adopted recyclable materials wherever possible. 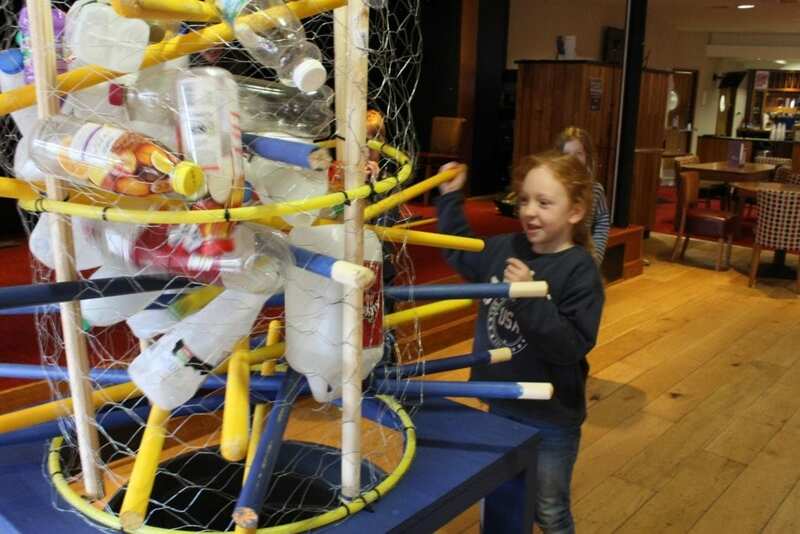 To take this a step further we wanted to help our youngest visitors to understand the importance of recycling and the responsible use of plastics. To illustrate this we created a quiz and put an environmental twist on the classic game kerplunk. 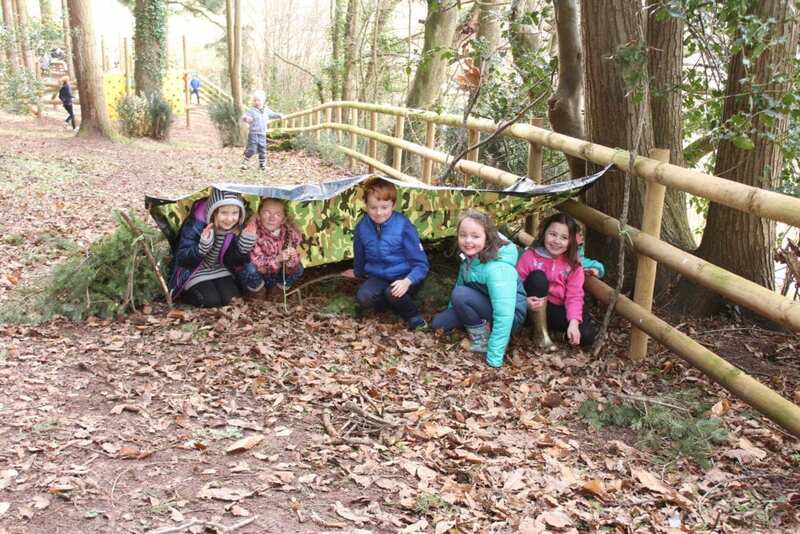 This exhilarating game saw children and their parents go head to head to answer environmental questions against the clock, remove sticks and plastic bottles from our giant game and go on to win the game. 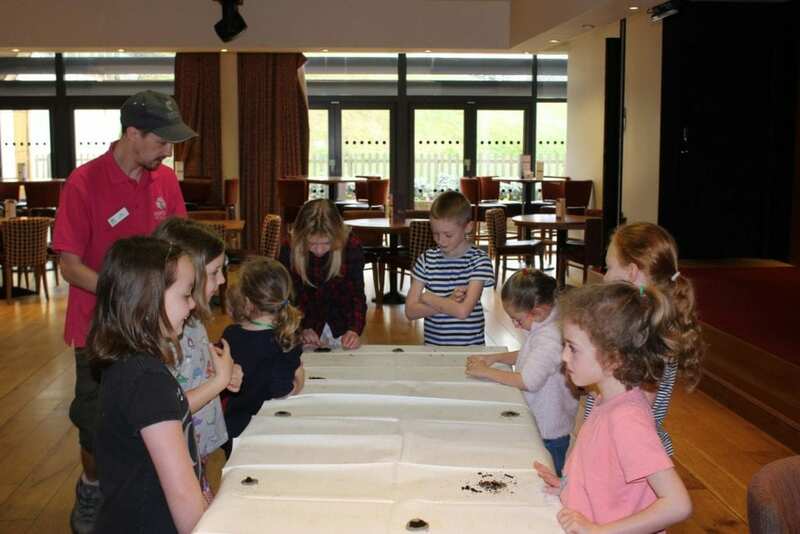 To help our insect habitats to thrive, our children’s daytime entertainment included the creation flower bombs, embedding seeds in clay to create an explosion of colour and habitats for those all important bee populations. Bee populations are fast diminishing and so the more we can do to produce fantastic habitats the better. At Cofton we have invested heavily in biomass technology for a more eco-friendly way of generating the energy needed to power the site. During a recent session, we spent time teaching children about the biomass generator, giving an insight into why it is cleaner and greener. 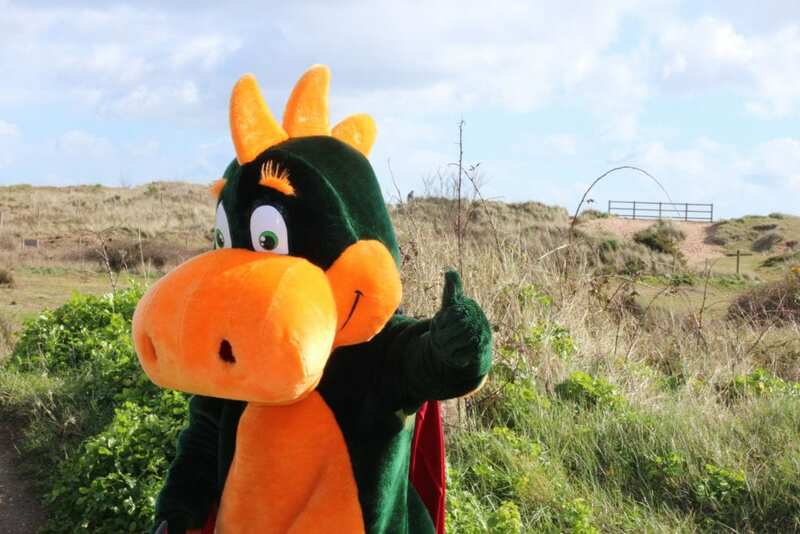 One delivery of wood chips can power Cofton for 10 days, including heating the swimming pool and showers. 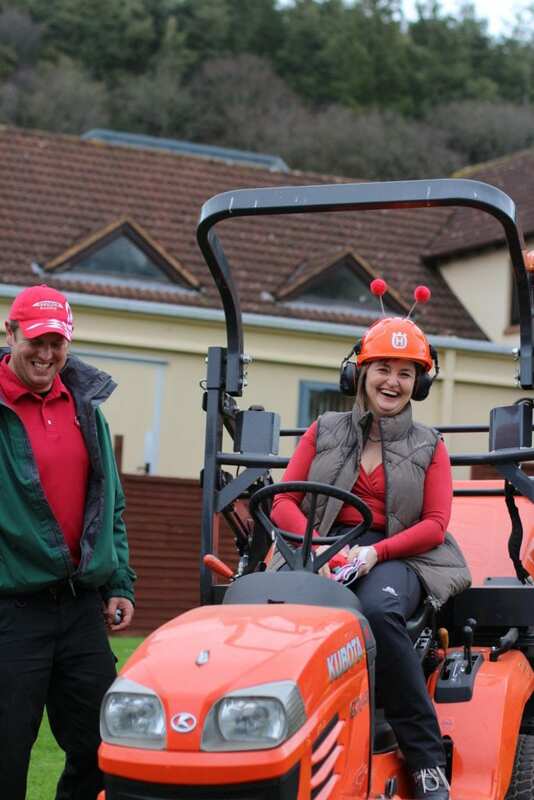 To find out more about Cofton’s commitment to keeping the site green take a look at our environmental page or to learn more about our exciting entertainments line up visit our entertainments page. 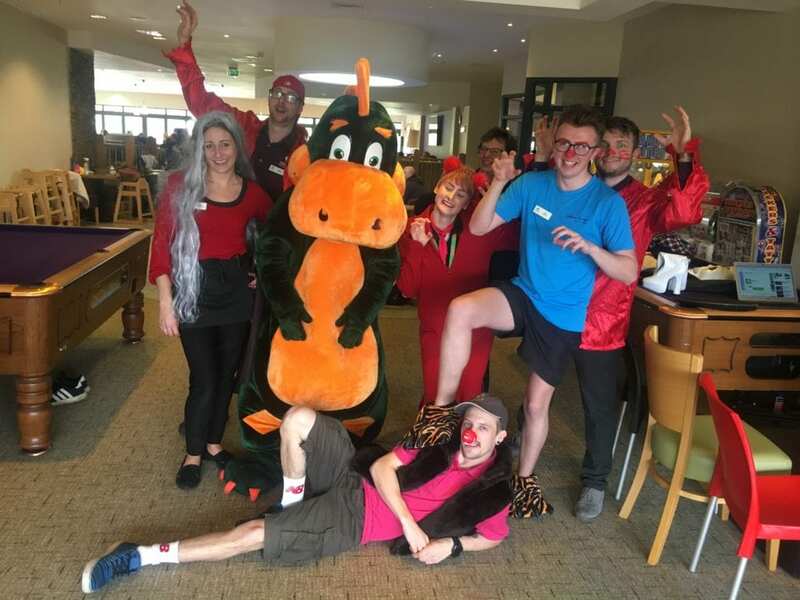 To support the amazing work of Comic Relief, the team at Cofton decided to have a management shake up and swap jobs for a few hours on Friday 15th March. If you were visiting on Friday you may have seen some unfamiliar faces in unfamiliar places. 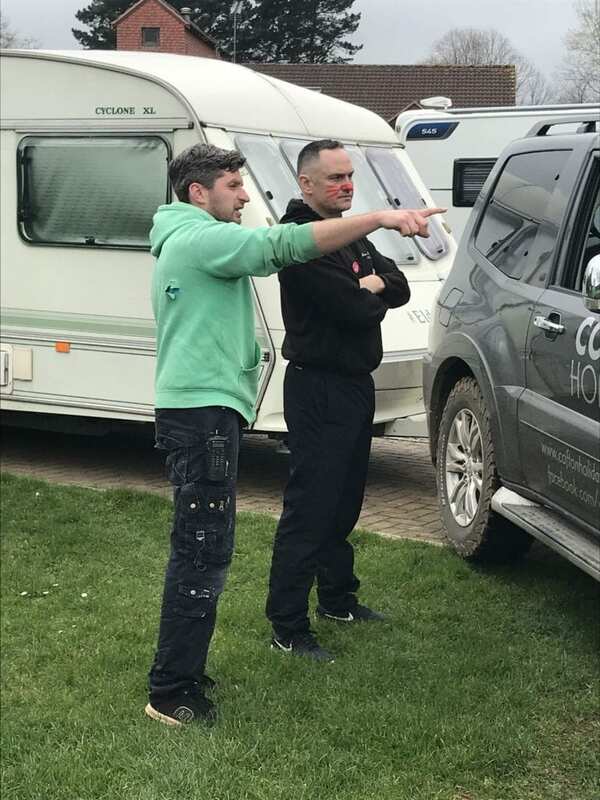 On a normal day around Cofton, you may or not see Scott in Action, but he is responsible for keeping the grounds looking great and the flowerbeds blossoming. 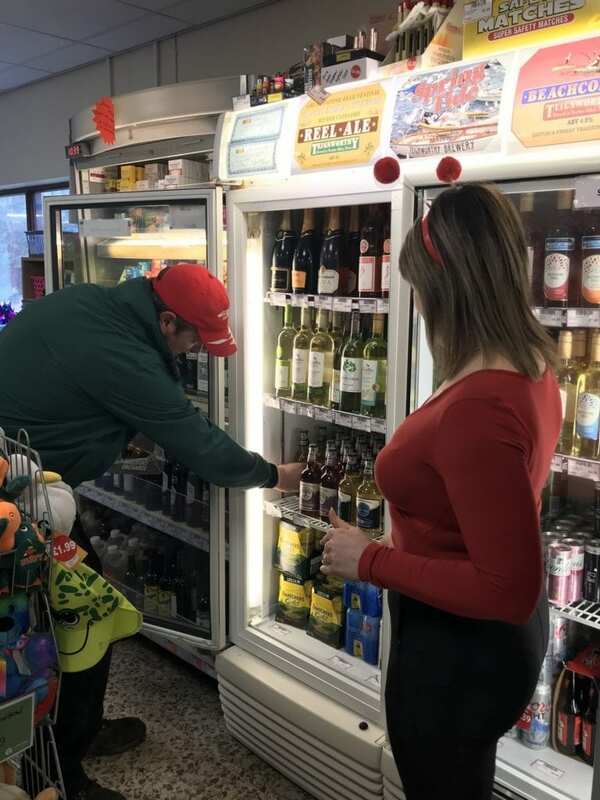 If you were visiting on Friday, you would found Scott learning the ropes in the Cofton on site shop, he was stacking the shelves, serving the customers and dealing with deliveries. 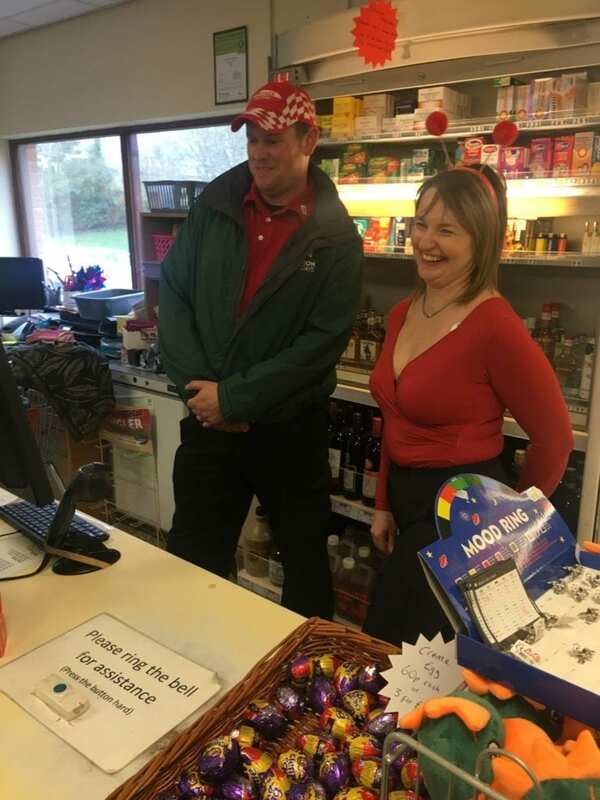 Gerry is one of the longest standing members of the Cofton team, having worked in Reception and a whole host of other roles before taking on the role as shop manager. 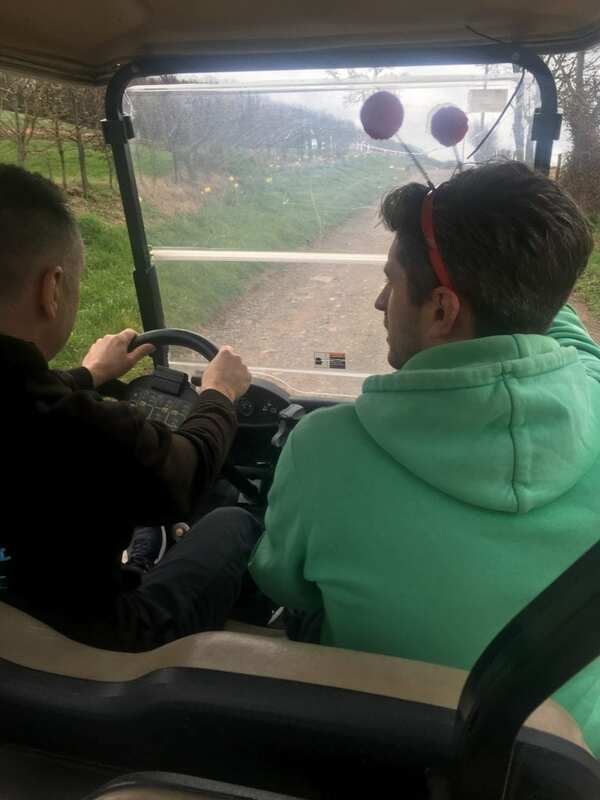 One place you will have never found Gerry previously is working with the grounds team, so for Comic Relief Gerry joined Scott our grounds manager to to learn the ropes. You will typically find Ian in Ashburn Springs, managing the fast growing leisure facility at Cofton. 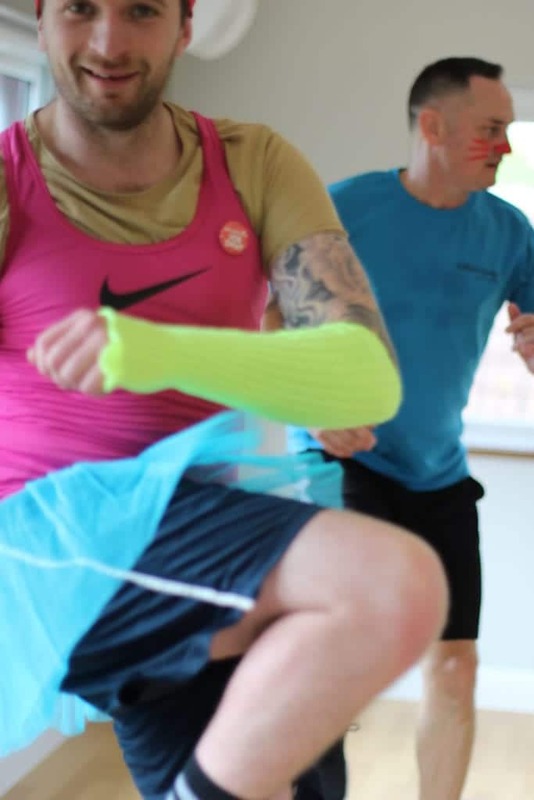 He is well known for his high energy classes, but for one day only, he took a step out of his fitness comfort zone and made his debut as a member of the guest services team. 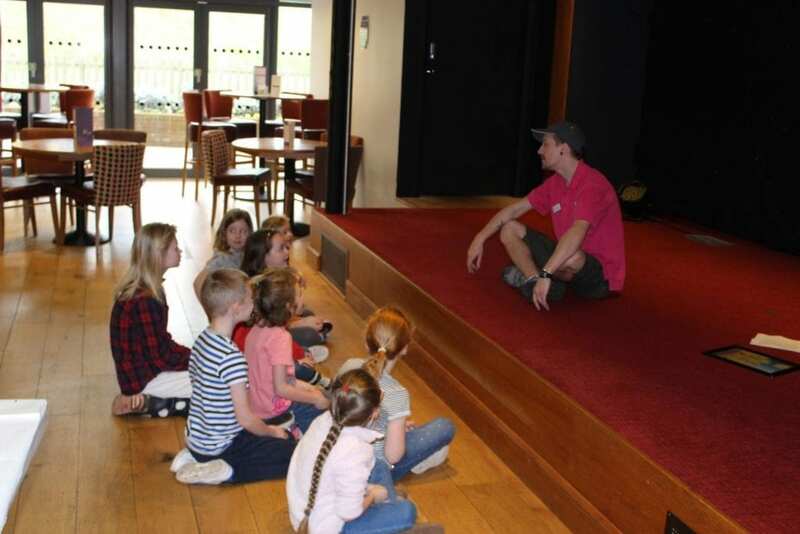 In this role he welcomed guests, tested his skills towing caravans and went on patrol of the holiday park to make sure everything was ship-shape. 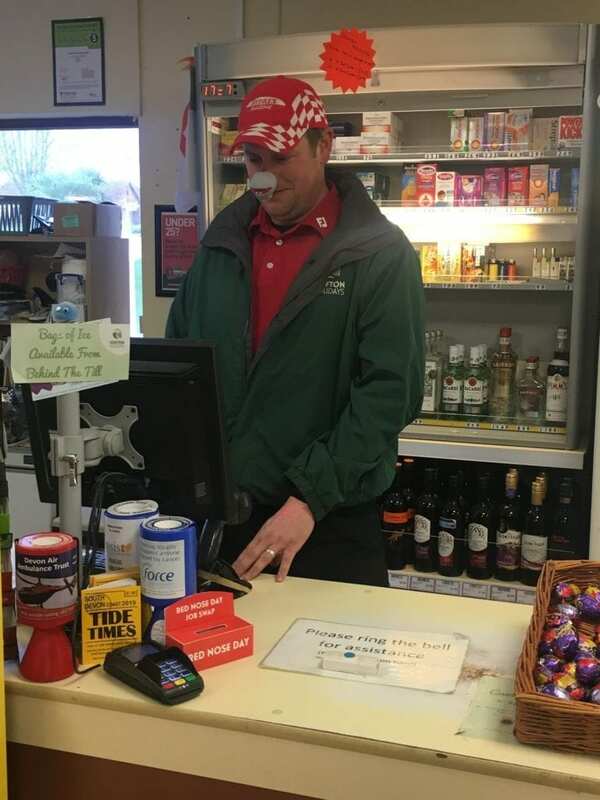 James is known for being the friendly face that greets you on arrival at Cofton. 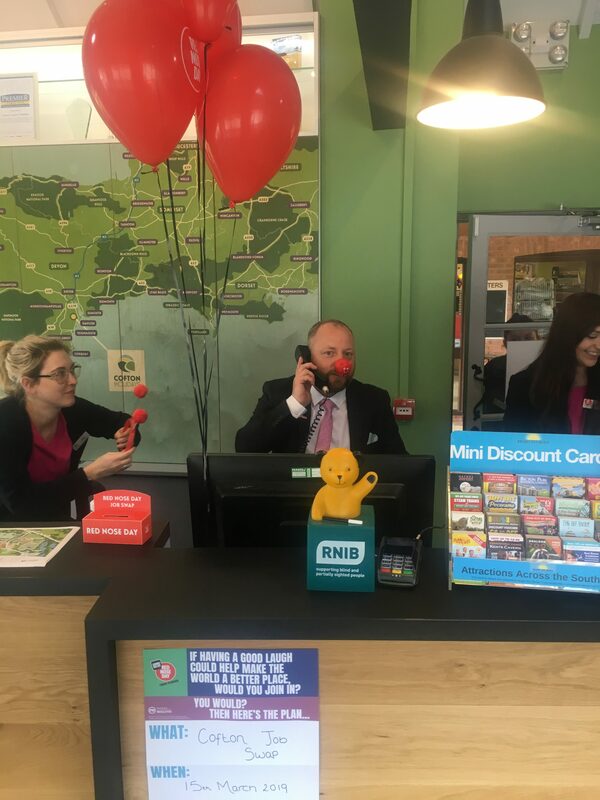 He makes sure every visit is just right, helping you to get the perfect pitch, making sure your caravan is in just the right place and is always on hand to answer any questions about your stay. 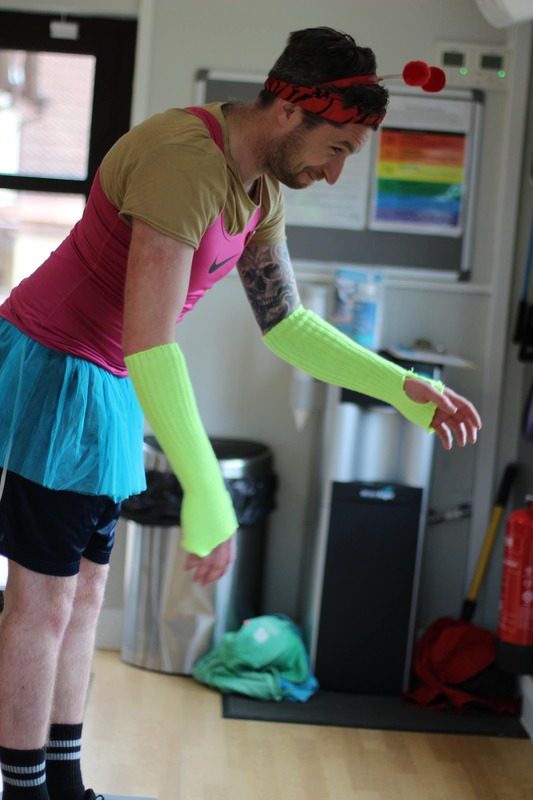 On Friday, James was transformed into a member of the fitness team and strutted his stuff in a step aerobics class. 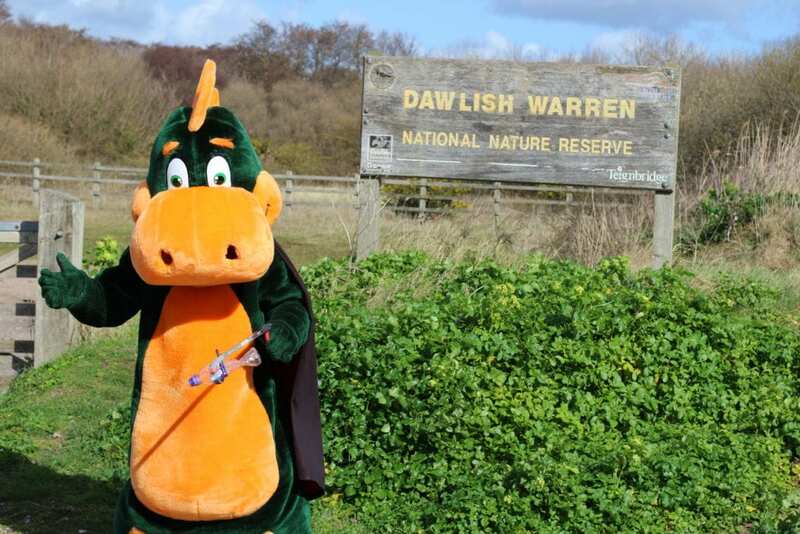 As a passionate fisherman, it’s rare you’ll find Luke straying too far from the 5 fishing lakes and tackle shop here at Cofton. 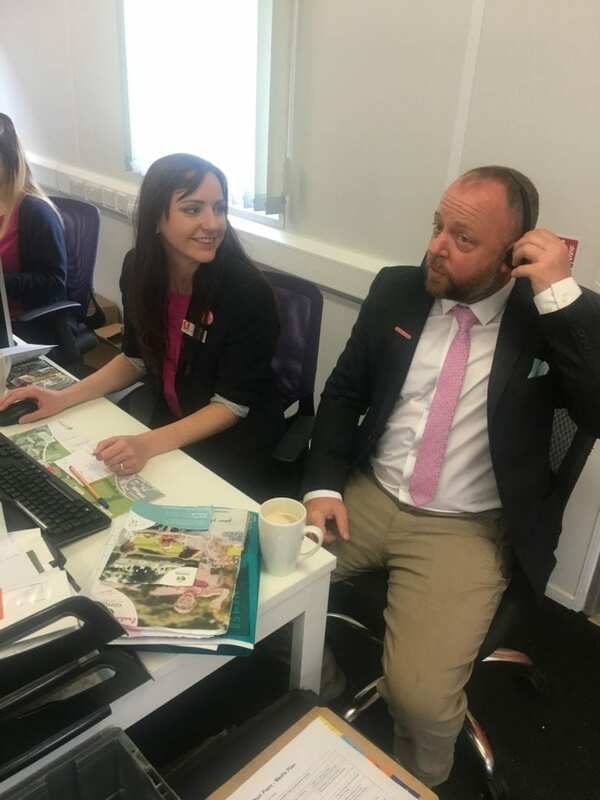 On Friday, he tried out life on the busy Cofton reception desk and it had to be said Luke had some impressive customer service skills. 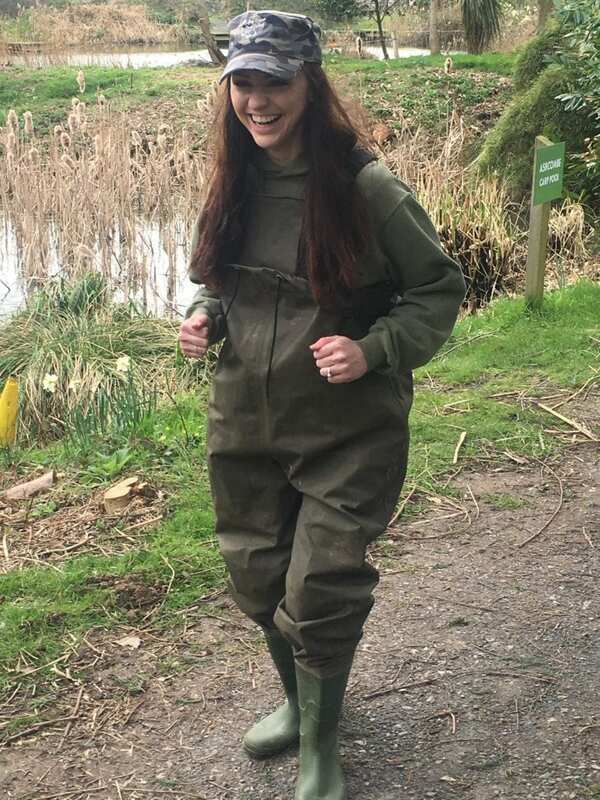 Swapping the busy reception desk and and call centre for a few hours at the fishing lakes, swapping with fishing manager Luke. 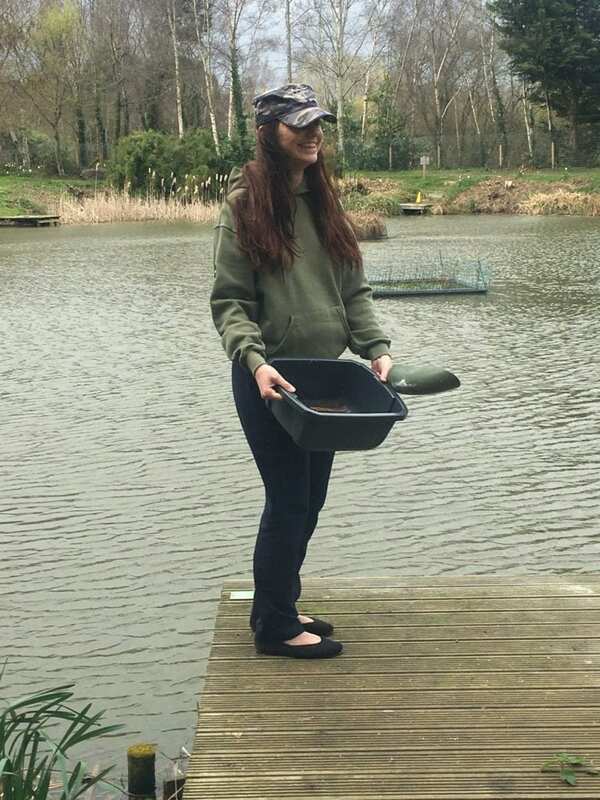 In her time as a fishing manager she got to work in the shop, feed the fish and look after the lake maintenance. 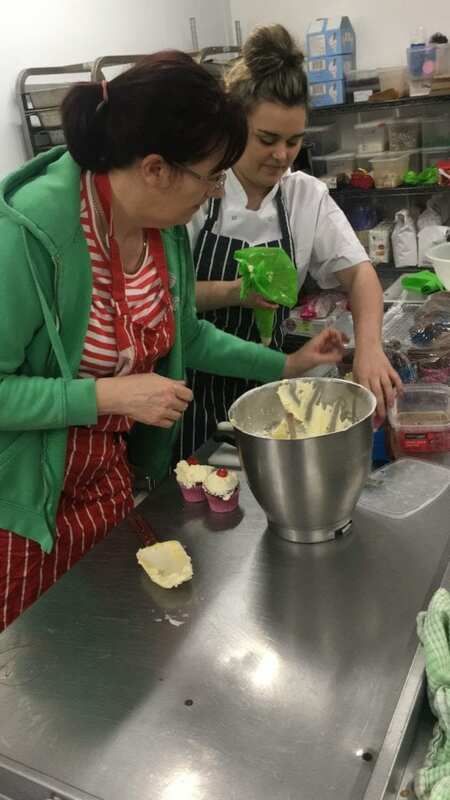 One of our newest recruits here at Cofton, head of housekeeping Paula, took to the kitchen to try out her baking skills. 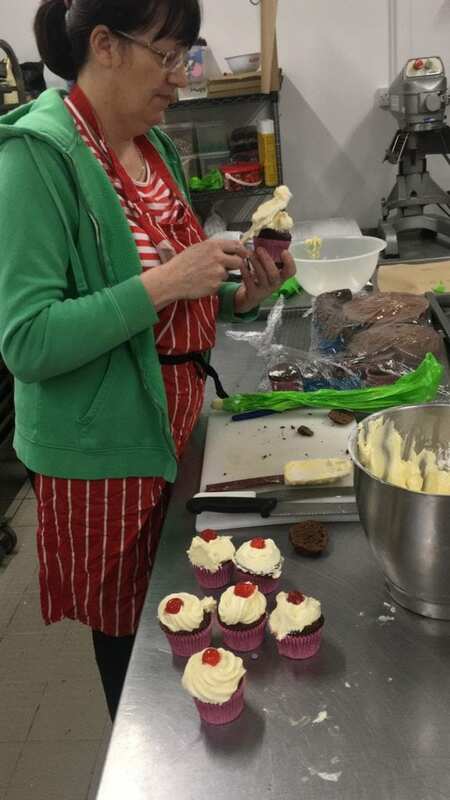 She made a batch of Comic Relief cookies and also tried her hand at decorating cakes. 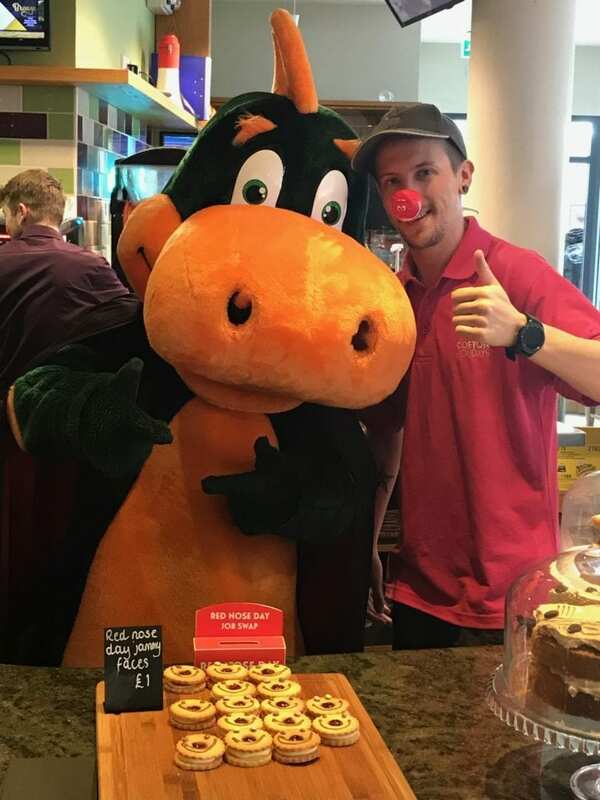 The entertainments team made there way to Amelias to serve some delicious Comic Relief biscuits to customers. 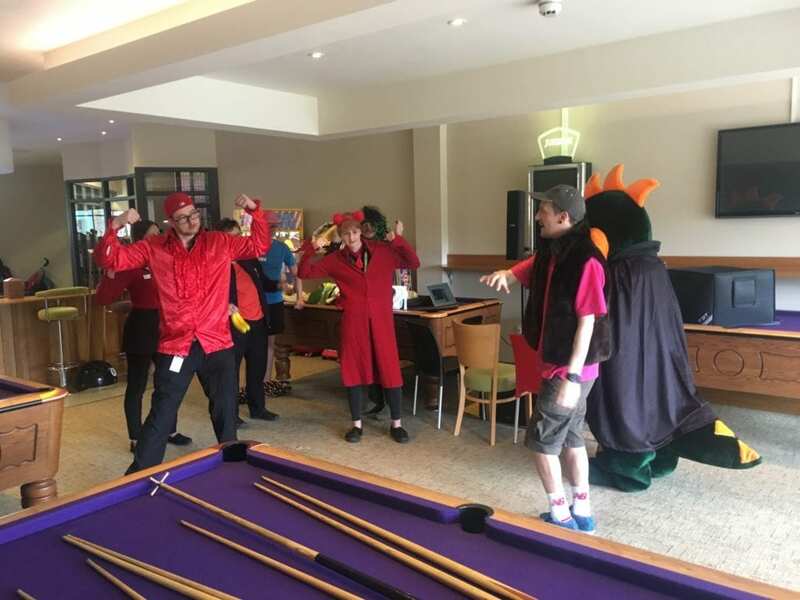 To finish off a busy day of job swapping, our bar and restaurant team took to the dancefloor and learnt the Digby dance. 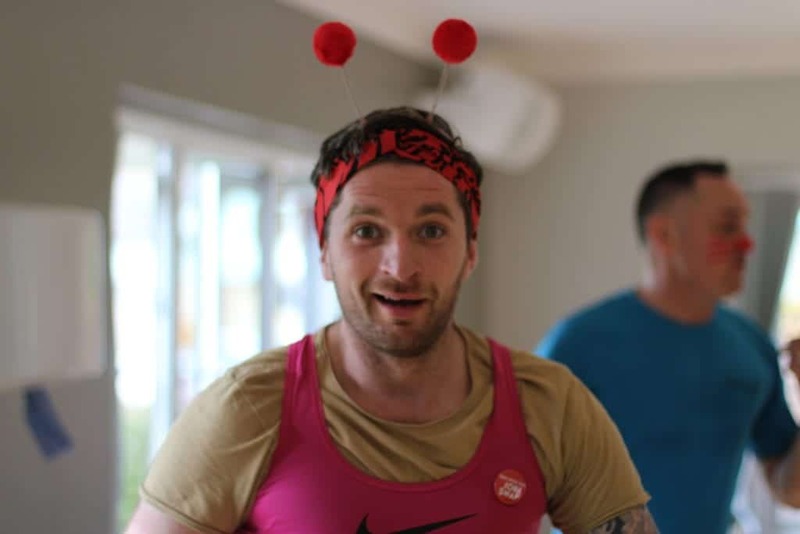 We are delighted to have raised £200 for this amazing cause, it was also a great opportunity for the team to get some perspective about what other members of the teams jobs are like. 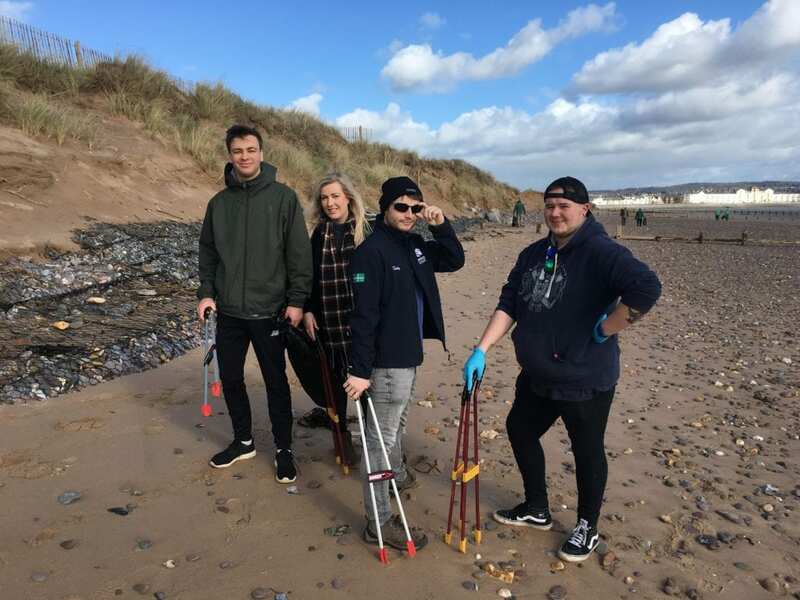 On Thursday the 7th of March, some of the Cofton team headed to local beach Dawlish Warren to take part in a beach clean up. 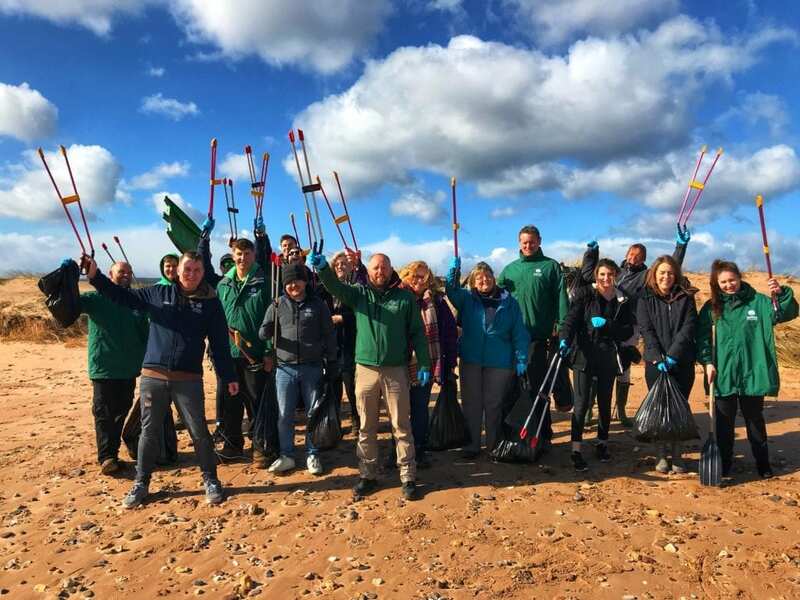 As a business that prides itself on looking after the environment and the amazing beautiful beaches on our doorstep, the team were all keen to work together, get involved and help to preserve the blue flag status. Staff from catering, management, marketing, HR maintenance and reception all headed to show their support for the clean up project. Here are just a few of the photos from today, we would love to get even more people involved next time. At Cofton we are extremely proud of the diverse fishing experience we offer to our guests. In summer 2018 we were excited to welcome Mark Bartlett to our park and lakes, a fox consultant and 2 times winner of the british carp championship. 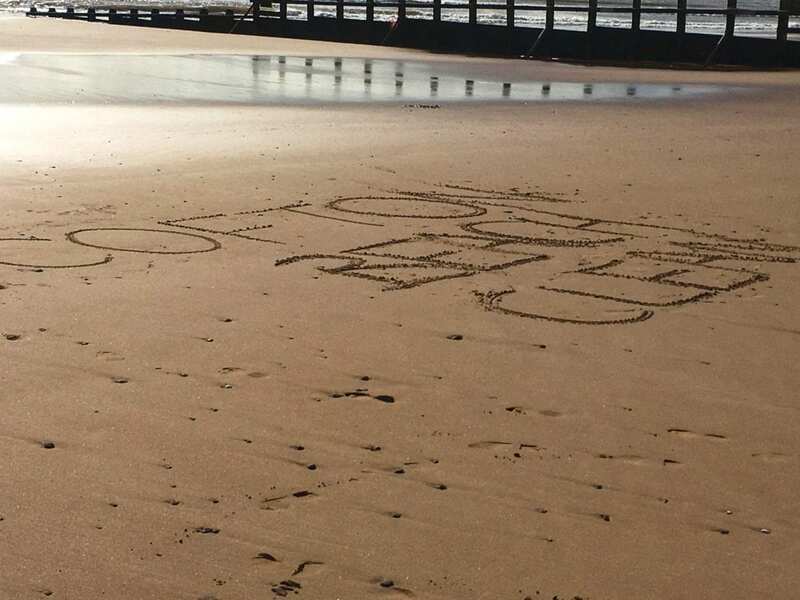 “Cofton is a great place to spend time. 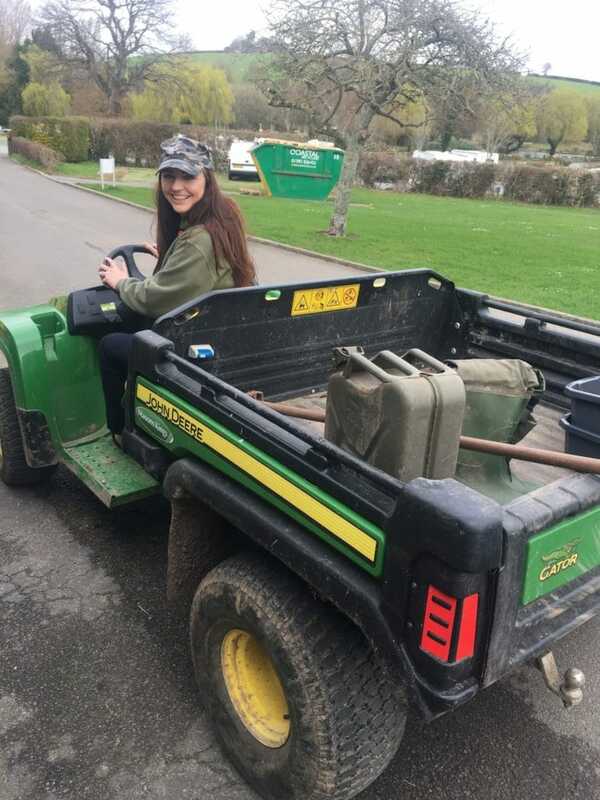 Aside from the awesome surroundings in the countryside and the facilities as a holiday park, you can escape to the lakes which are perfect to accommodate all types of fishing. During my stay at Cofton, I fished at dawn creeping around the corners of the lakes, stalking the carp, before heading back for breakfast with a few fish under my belt. Then in the evening catching carp to upper doubles on floaters in the Luscombe and Trusham Lakes. On the Wednesday of my trip I fished the mid week open match on Mamhead lake, which was another great day catching carp on the waggler and feeder to an island. I then had a late run of decent skimmers on the pole to win the match which was fantastic. 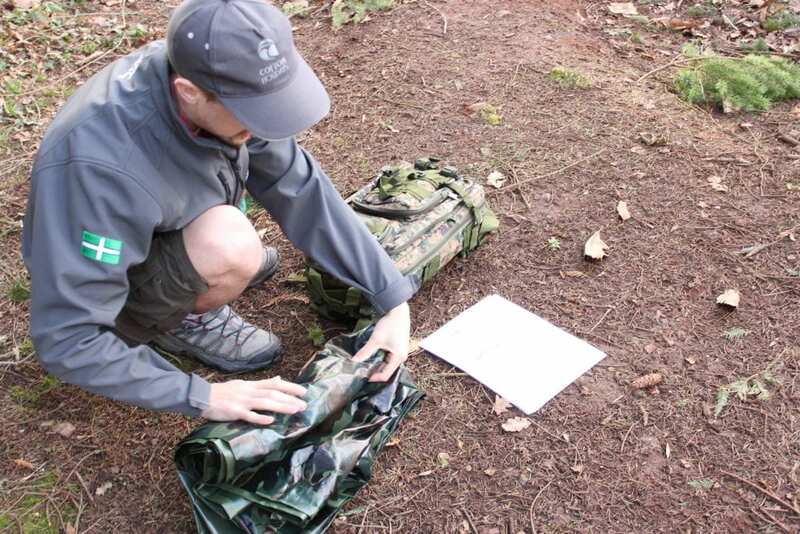 Mark came for a Family holiday, but couldn’t leave without trying out Coftons carp fishing experience. 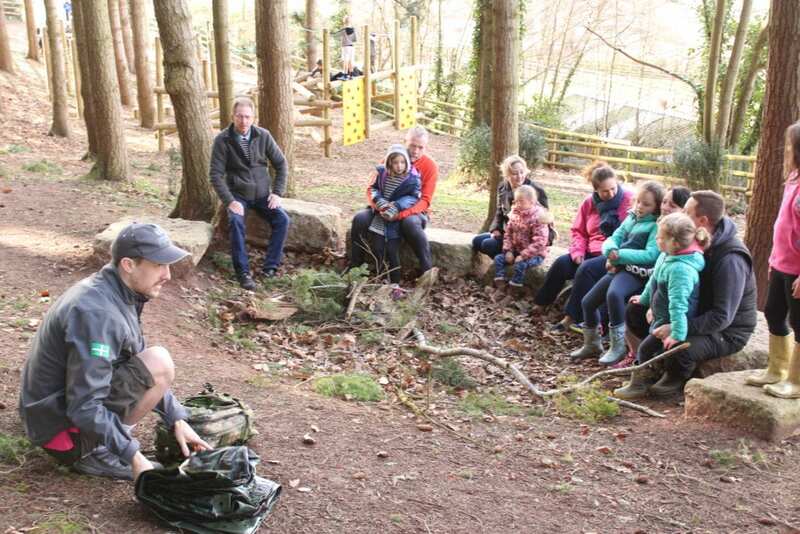 On the 19th of February 2019, a team of brave children and their parents took to the woods to learn some essential survival skills with the entertainments team Jay and Craig. 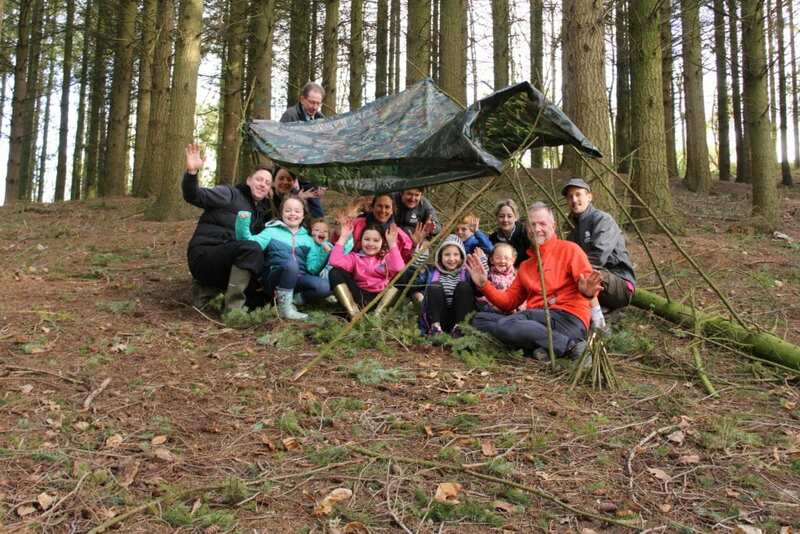 During the session the participants learnt all important knot tying skills, before building a shelter that was both creature and monster proof. 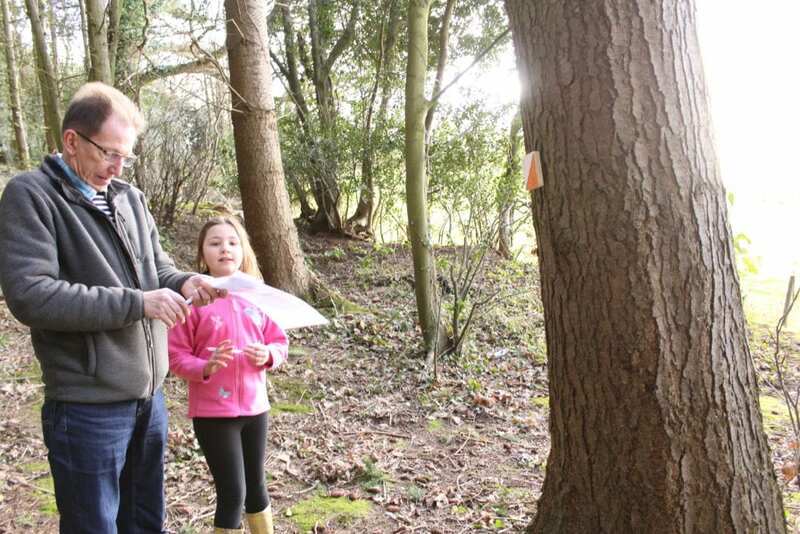 After successful shelters had been built, the teams had to solve a puzzle and learn to read a map with our orienteering challenge. 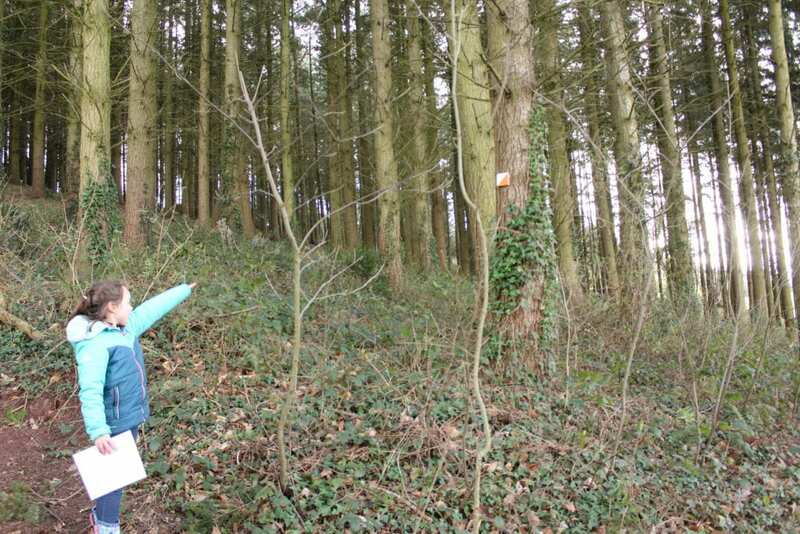 The aim was to find your way around the forest, using the map and searching for hidden numbers on trees. 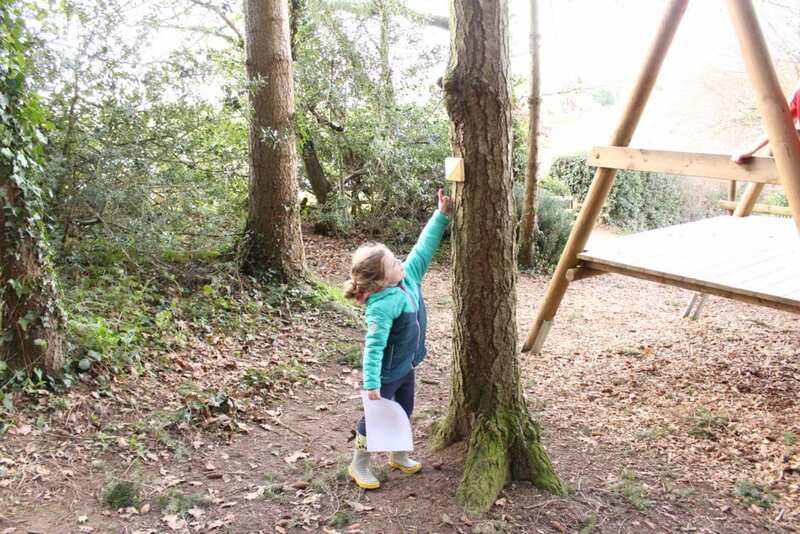 Each number on the tree had an accompanying letter, the aim was to be the first team to solve the puzzle and spell the word. 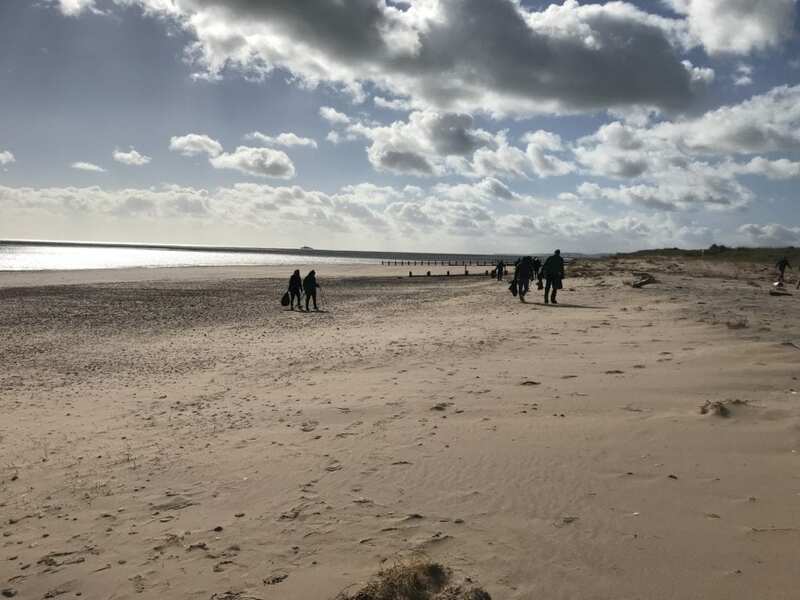 Teams successfully completed the mission and even found traces of Digby on their adventures…A great day out enjoying the great outdoors. 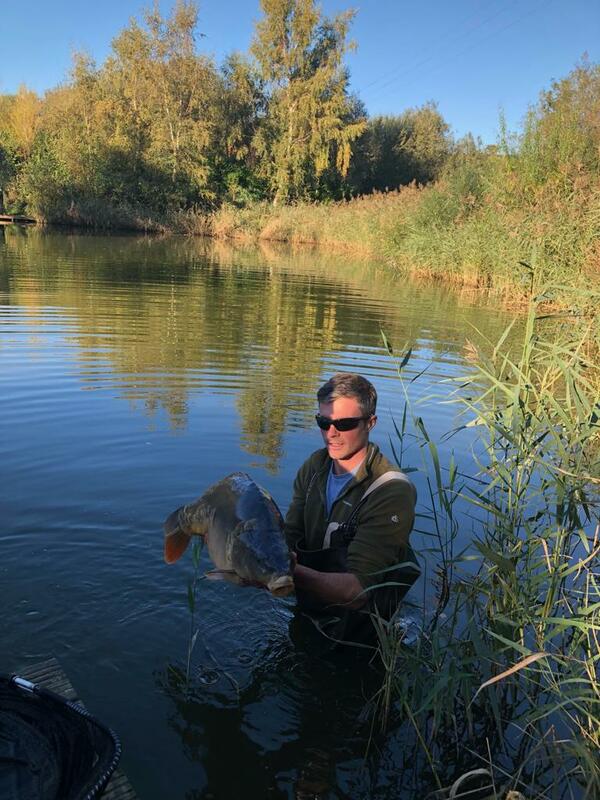 In October 2018 we were delighted to welcome 9 hand picked specimen carp to the fishery as part of a continued investment in the fish stocks at Cofton. You will find these stunning carp in their brand new home in the Trusham Specimen Lake. In early 2018 we drained the lake and netted the fish removing the silvers and the majority of the small carp. Over 100 single figure carp were moved to the match lake. 80 fish from doubles to 24 lb were put back giving them the room to flourish and hopefully grow on. 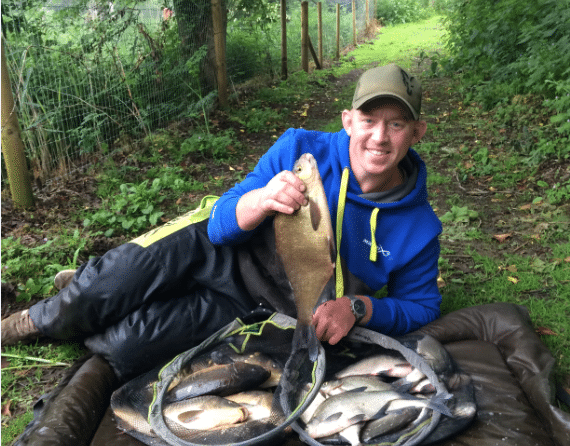 The new fish were sourced from top fish farmers at Priory Fishery have now settled in and will be gracing the nets of our guests this season and hopefully for many seasons to come. 5 of these fish weigh over the magic 20lb with the others not far behind. Young, scaley mirrors each very distinctive and individual. 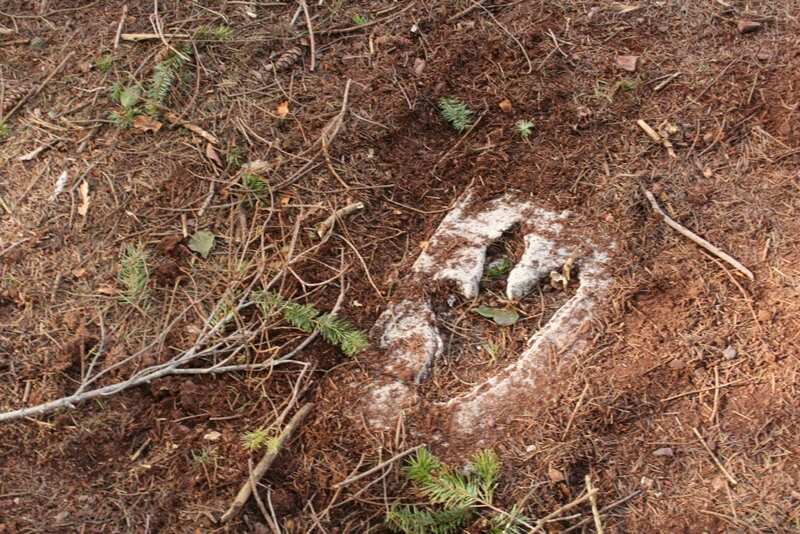 It is going to be exciting tracking their growth over the coming years. Trusham is now set to be an amazing specimen water with everything in place to make fantastic fishing memories. Weights for the new fish 23.6, 22.4, 20.8, 20.4, 20.2, 19.8, 18.8, 18.2, 15.3 all mirrors.